If you’re anything like me, you probably have hidden a stash of Halloween candy in your room that you’re saving for a cramming-for-an-exam chocolate fix. If you’re like other people, you’ve already finished that candy and rushed to CVS to buy more on sale. Regardless, instead of eating Milky Way after Milky Way, you should try this 15-minute recipe for a sweet snack anytime, especially now that finals and winter break are coming up. Some might call them “Muddy Buddies,” but for me it’s always been called "Puppy Chow," and usually when I say that, people give me a weird look and wonder why I want to make dog food in my spare time. But no, puppy chow is a sweet and salty, chocolate and peanut butter mix that will curb your candy fix and give you motivation to finish any assignment you’re working on. It will cover your hands in powdered sugar, but it’s worth every handful. Yes, you may be able to find it bagged up at City Co., but why spend the extra money when you can make it yourself, customize it to what you’re craving, and take a break from cramming? It’s perfect for finals, snacking on winter break, and gives you the perfect combination of salty, sweet, crunchy, and lightness… yum! 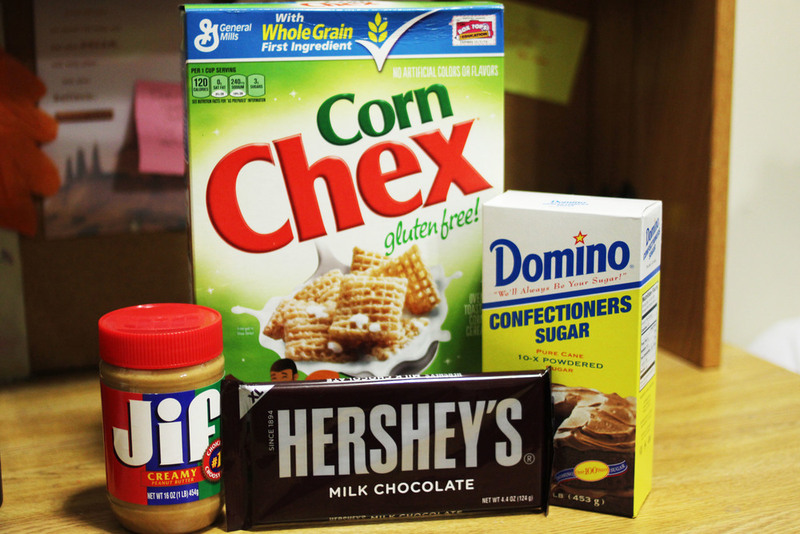 It is a perfect way to use up your spare Hershey bars and, if you choose to share, make friends around your dorm. Oh, and did I mention all it takes is a few supplies and a microwave? Now you have to try it. Enjoy! *These recipes make a lot, so if you only want a little bit, be sure to adjust the ratios! You don’t have to be too exact, measuring cups are definitely not necessary. Instructions: 1. Into large bowl, measure cereal; set aside. 2. In 1-quart microwavable bowl, stir together chocolate chips, peanut butter and butter. Microwave uncovered on High 1 minute; stir. Microwave about 30 seconds longer or until mixture can be stirred smooth. Stir in vanilla. Pour mixture over cereal, stirring until evenly coated. 3.Pour into 2-gallon resealable food-storage plastic bag. 4. Add powdered sugar. Seal bag; shake until well coated. Spread on waxed paper to cool (optional). Store in airtight container in refrigerator. Stove-Top Directions (if you’re lucky enough to have a kitchen! ): 1. Into large bowl, measure cereal; set aside. In 1-quart saucepan, heat chocolate chips, peanut butter and butter over low heat, stirring frequently, until melted. Remove from heat; stir in vanilla. 2. Pour mixture over cereal, stirring until evenly coated. 3. Pour into 2-gallon resealable food-storage plastic bag. Add powdered sugar. Seal bag; shake until well coated. 4. Spread on waxed paper to cool. Store in airtight container in refrigerator. For a twist, skip the Hershey’s and peanut butter and try melting some Milky Ways, following the rest of the steps! Instructions: 1. Into large bowl, measure cereal; set aside. 2. In 1-quart microwavable bowl, stir together chocolate and Nutella. Microwave uncovered on High 1 minute; stir. Microwave about 30 seconds longer or until mixture can be stirred smooth. Pour mixture over cereal, stirring until evenly coated. Pour into 2-gallon resealable food-storage plastic bag. 3. Add powdered sugar and pumpkin spice. Seal bag; shake until well coated. Spread on waxed paper to cool (optional). Store in airtight container in refrigerator. Instructions: 1. In a microwave, melt the white chocolate until smooth and runny. 2. In a small bowl, combine cake mix, powdered sugar, and sprinkles and stir to combine. Set aside. 3. 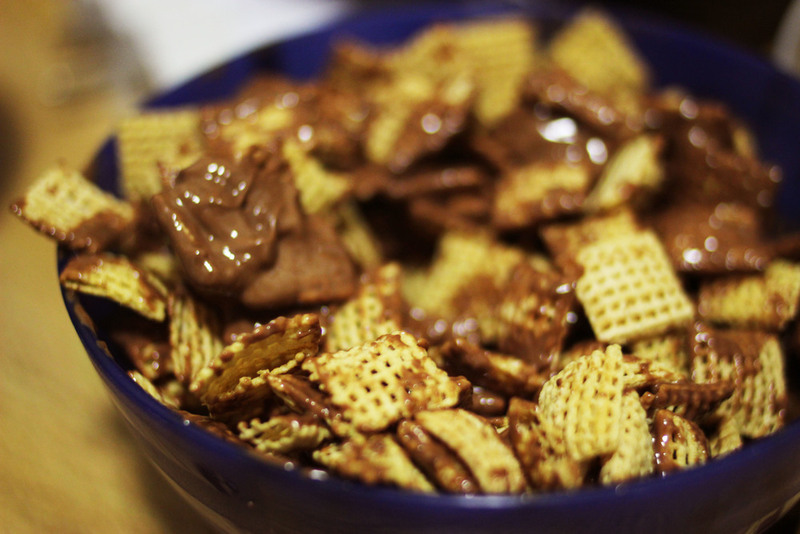 Measure out the 6 cups of cereal into a large bowl, drizzle the chocolate all over and use 2 forks to gently toss the cereal to coat each piece. 4. Once cereal is completely coated in white chocolate, dump the cake mix/sugar mixture on top and gently toss again with the forks to coat each piece. 5. Spread out on parchment paper to cool completely (optional) and store.